Why: Because it’s going to be amazing. Director David Fincher (Fight Club) has created a movie that explains the controversial creation of Facebook in the most amazing way. 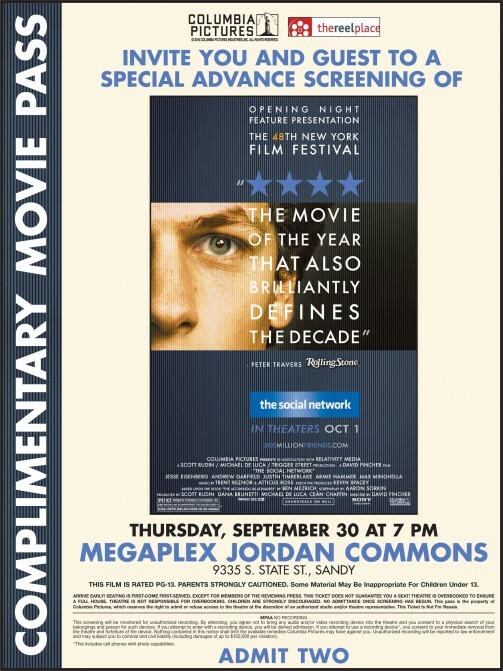 The Social Network is already being heralded as a generation defining film, one of the best of 2010. I cannot give you my opinion of the film until opening day, but please listen to me when I say that you NEED to attend this screening. To get your passes, simply click on the image below. When it opens a larger version in a separate window, click print. The theater will begin exchanging the printable passes for actual tickets at 4:00PM. Having a pass will not ensure you getting a ticket, so arrive before 4PM if possible. IT WILL SELL OUT.